The Western Blotting Application Solutions Kit is designed to conveniently provide reagents needed for western blotting, from cell lysis to protein detection. The reagents in this kit are thoroughly validated with our primary antibodies and will work optimally with the CST western immunoblotting protocol, ensuring accurate and reproducible results. This kit includes sufficient reagents to run 10 mini-gels and complete western blot assays with either rabbit or mouse primary antibodies. 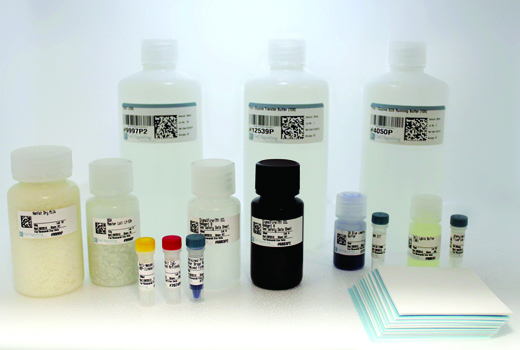 All reagents in this kit are available individually. All components in this kit are stable for at least 12 months past the reference date indicated on the component label when stored at the recommended temperature and left unused. Upon receipt, BSA and 3X Blue Loading Buffer should be removed from #13005S and stored at 4ºC and at room temperature, respectively. The 30X Reducing Agent and remaining #13005S components should be stored at -20ºC. All #13131S reagents should be stored at room temperature. IMPORTANT: Please refer to the primary antibody datasheet or product webpage for recommended primary antibody dilution buffer and recommended antibody dilution.